Whoaaa, back in Thursday and tomorrow is definitely be your weekend! Be strong, belles…! 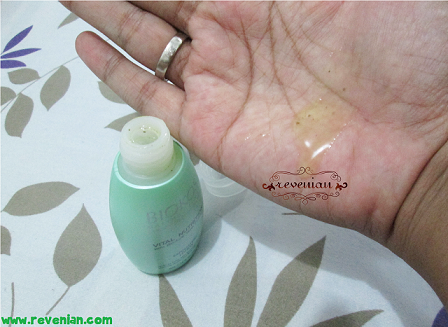 Back in my blog, now I’m going to review one my current skin care product from Biokos. Just let me doing some short story tell first, OK? Some of you may know that I often posted in my socmed account that I currently have a skin problem: ACNES. Though I have a combo skin of normal and oily one, I’ve always been doing a double clean regime since I was in my high school. That’s the answer to some people’s question why I have been having barely acne prone skin. So said, it has been 10 years of doing that thing. But now, I don’t know why suddenly I have this acne problem. For the whole July, I had been trying some acne skin care regimes by using on the market products but the result turned zero: they keep staying on the place, more over they were bringing their friends, little by little.. That was freaking me out! And after searching here and there, I decided to see a dermatologist near my place. Thanks God, they’re mostly gone right now after seeing a dermatologist by the end of July. Since I was told to go back to do a facial treatment every two weeks, but I didn’t. I (always) prefer doing facial at home with my own stuffs. 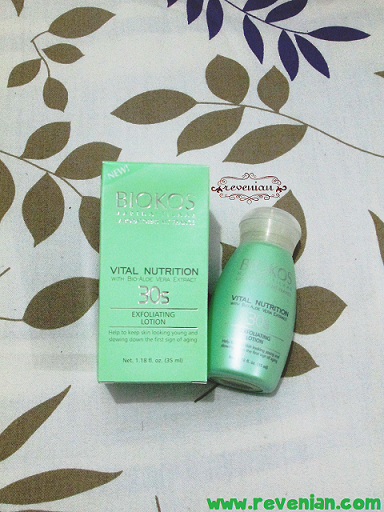 And then I run out of my peeling cream but thanks God I have a stock of exfoliating lotion: Biokos Vital Nutrition 30s – Exfoliating Lotion. I got this as a hamper from Martha Tilaar’s Biokos and Caring Colors make up class event way back then.. Event report is here. Thank you Martha Tilaar! Now let’s begin the review. *Packaging: from the packaging, there’s a 35ml green plastic bottle with a twisting white plastic cap comes within a green box. The bottle’s design seems old fashion in my opinion but that’s OK. The thing that I like the most is this size comes as a travel friendly thing. Definitely becoming a beauty on-the-go product! On the back side of the box, you can see the product’s explanation and a how-to step. By the left side of the box, you’ll find the ingredients list and some info that you may need to know. And by the right side of the box you can see the range of Biokos Martha Tilaar that you may find on the stores depending on your age. *Scents: When I opened the cap, the fresh scent came out. I like it. It reflects the scents of green tea, a little bit of jasmine, and aloe vera. Well, not really sure. Hehe. But to be frank, it’s freshly scented and very relaxing. *Texture: I don’t think this reflects a form of lotion because the way I see it, it’s too runny as a lotion. So I may say an exfoliating gel? Not sure! Teehee~~ But I believe, since the ingredients contain Coral Sponge, let me say that this thing acts as an exfoliating agent. A bit rough when you touch it but definitely doesn’t harm your face at all. 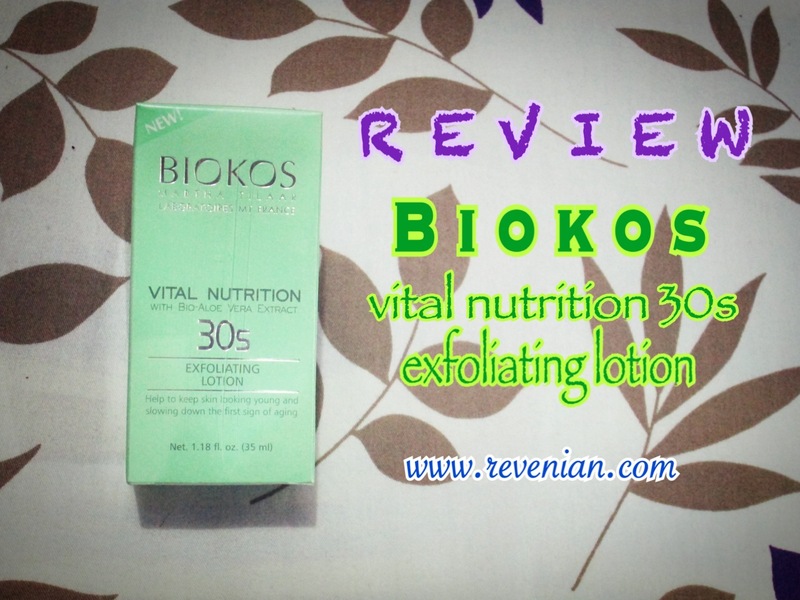 Warning: you may find this picture is gross enough but for your reference, this is what happen after you exfoliate your skin with Biokos Vital Nutrition 30s – Exfoliating Lotion. 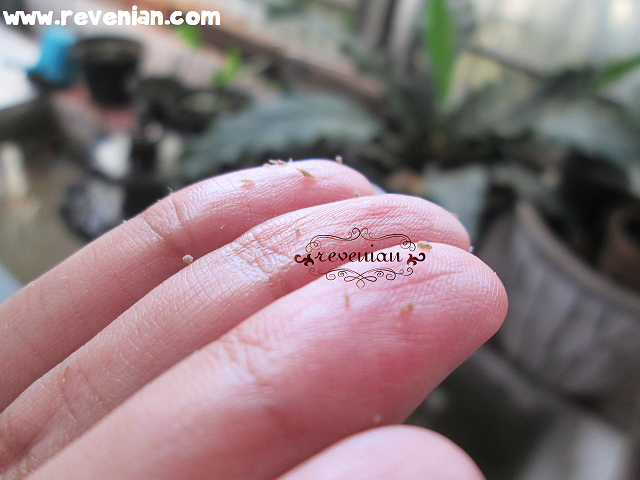 The result is, the coral sponge acts as an exfoliating agent that help you to clean the face from skin dead cells. Since I prefer to have my facial done at home, basic one of course, I’m pretty happy knowing this exfoliating lotion is somewhat a little bit different with any exfoliating products I have ever used. It feels light weight and quiet hydrating on my skin, the lotion gel feels like a moisturizer thing. I guess it may be better if you put it first to fridge prior using considering the gel form (in my opinion). I’ll try it for the next exfoliating do. For the coral sponge that acts as exfoliating agent really cleanses your skin, leave it moist, smooth and the fresh feeling afterwards. It doesn’t harm your face considering the rough feeling when you rub it as your first impression, so don’t be worried. Repurchase? Yes, I’ll do a repurchase after I run out this one. But, I can’t help myself of trying new product. Hehehe. I really need to amp up my skin regimen. Thank you for sharing this product. Will definitely check the product out. Thank you for sharing this review. I’ll have to keep an eye out for this. I do need an exfoliator. I was pretty surprise by the result this exfoliate gel didn’t give any redness after using it. I’ve ever heard when I joined beauty blogger gathering with Martha Tilaar, one of the spokesperson said it is definitely fine if you want to use this exfoliator even you’re not 30 yet. This age classification only refers to most skin condition in certain age. So if you are in 20 now, it’s OK using this exfoliator. Great review! Thanks so so much for sharing! I’ve been looking for an exfoliating cream for awhile now. The scrub looks so gentle and not harsh for the skin. Would love to try this out. dari kemaren mau beli ini belom kesampean.. I see Biokos around here but I never really checked them out properly. I have dry skin so I need to exfoliate a lot. I think I’ll try this out soon! So it’s just a screw cap bottle? Ehh, not a fan of the packaging. They should have provided a pump head or even a squeeze bottle. I’ve never really used exfoliating lotions but this looks pretty good. Great review. I like very much natural products and I think that this is great! if exfoliating thing, is it daily use?